This version is a triumph – gluten free lemon coconut cake! Sweet creamy coconut enhanced with a dash of lemon tang. It’s springy, airy and has a sweet twist of Goji Berry. Carton contains 5 x475g mixes. 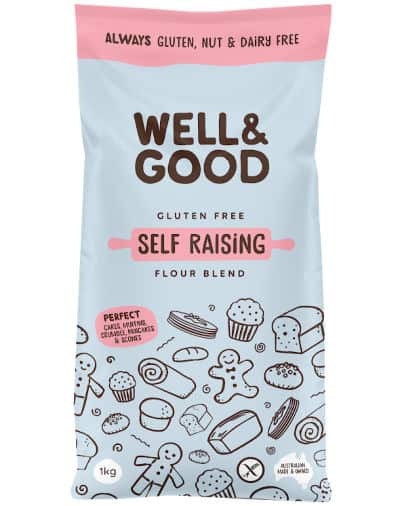 Gluten free flour mix (rice flour, corn starch, tapioca starch, desiccated coconut), sugar, raising agents (sodium bicarbonate, calcium phosphate, sodium pyrophosphate), thickeners (non GMO tapioca starch, xanthan gum, sodium carboxymethylcellulose), natural lemon flavour (1%), vegetable emulsifier (mono and diglycerides of fatty acids), iodised sea salt, natural colour (turmeric). Icing Mix(15.8%): Icing Mix(Sugar, Corn or Tapioca Starch), non GMO modified tapioca starch, sugar, citric acid, goji berry powder (0.1%). Food allergies affect a surprising number of people. Research shows that up to 5% of children have at least one of the following common allergies: Gluten, Eggs, Milk, Peanuts, Tree Nuts, Seafood, Sesame and Soy. Being Allergy Aware signifies that our company follows stringent policies and procedures to ensure we manufacture safe, allergy aware products.